The placement tests below are "end of the year" tests for Math Mammoth South African version. In other words, the tests are meant to be taken AFTER studying the particular grade. You can also use these tests as general maths diagnostic tests, to help you find if your student has any gaps or has not learned specific topics, because the tests group the questions by topic. Just look at the test results per "sections" of similar problems (addition, multiplication, measuring, geometry, place value, problem solving). You can always email me your child's test results if in doubt. 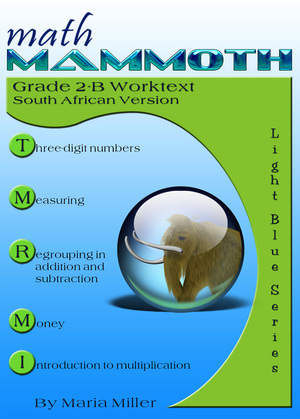 I advise that in order to start with Math Mammoth complete curriculum for grade level X, the student should score 80% or more in the previous year's "end of year" test. Children scoring between 70 and 80% may also continue with the next grade, depending on the types of errors (careless errors or not remembering something, vs. lack of understanding). Use your judgment. Tip: If you notice your child has problems with one or two concept areas in a particular test, but otherwise does fine, you can use Math Mammoth Blue Series books to "fill in those gaps". You can also email me with your test results if you have trouble deciding which Blue Series book you should use for such remedial work. This is a COMMON situation for many students. It usually stems from the lack of good word problems in the maths program the student has studied from. Please read what I have written about the problem with word problems so you can understand its origins better. Or, you could perhaps use Ray's Arithmetic as a catch-up tool, since it is filled with word problems.